CHYNADIYOVO, Ukraine — When Olha Prokup thinks about the war in the east and the number of Ukrainian men who have died there, she is saddened by the human cost the fight against the Russian-backed separatists has taken on her country. 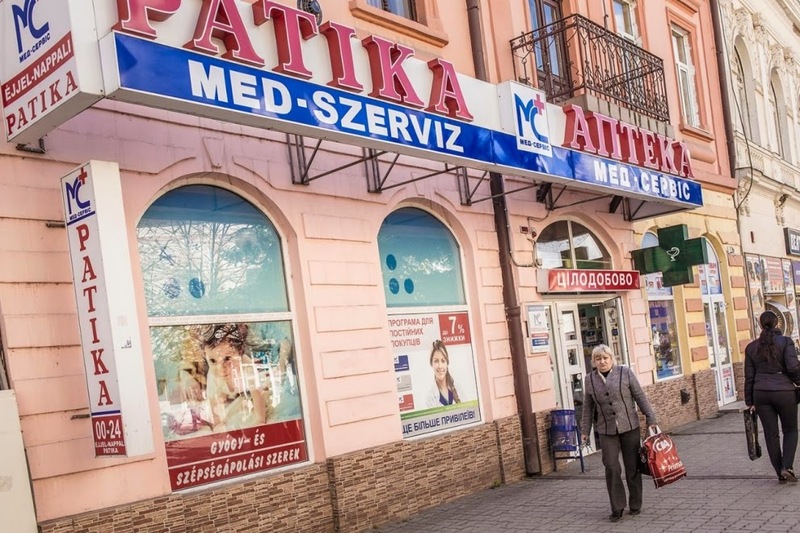 A pharmacy in the city of Berehove with signs in Hungarian and Ukrainian. Like many Ukrainians, she’s worried about the war. But as a member of a minority group, Prokup, 75, doesn’t understand why a year ago, the mostly Russian-speaking region of Donbass began the uprising that led to all the brutality. “We don’t understand what they were complaining about,” she said, referring to claims by the pro-Russian rebels that the new EU-leaning government in Kiev was oppressing ethnic Russians and Russian speakers in Ukraine. Minority groups in Transcarpathia, where Prokup lives, say that is not the way the Russian media would like the world to see things. As the conflict between Moscow-backed separatists and Kiev’s forces rages on in eastern Ukraine, minority groups say Russia’s state-owned media have been trying to provoke dissent in the multicultural region of Transcarpathia, on the edge of the European Union. Transcarpathia is wedged into the westernmost corner of Ukraine against the borders with Hungary, Romania, Slovakia and Poland. It was the last region to officially join Ukraine, after Czechoslovakia ceded it to the Soviet Union in 1945, and almost everyone has a relative living across one of its four borders. The region’s population of 1.3 million is a mixture of all the bordering nationalities, plus Ukrainians, Russians, Ruthenians and a large population of Roma. In the regional capital’s squares and cobblestoned streets, it’s as common to hear Hungarian as it is Russian or Ukrainian. Bilingual signs can be found across the region, particularly in areas where there is a heavy concentration of one group. Some in the region say that through a campaign of embellished and often outright fabricated news reports, the Kremlin has tried to paint a picture of frustration and distress among Ukraine’s minority groups living under an unsympathetic far-right nationalist government in Kiev. The most recent example of this is a mid-March report aired on a popular Kremlin-owned channel claiming that some 10,000 Ruthenians, an eastern Slavic people with a large concentration in Transcarpathia, convened a congress and were demanding autonomy. Prokup, a Ruthenian and the director of a local Ruthenian choir, Babchyna Spivanka, never heard of the meeting. Nor had the de facto leader of the Ruthenian community, Yevhan Zhupan, until he received a frantic phone call from a friend the night of the report. Prokup and Zhupan said there was no meeting of thousands of members of the close-knit Ruthenian community in March and no call for autonomy. The report was simply made up, just as a similar one was the year before, Zhupan said. “This wasn’t the first provocation from Russia in our region,” said Zhupan, the head of the Carpatho-Rusyns People’s Council, an umbrella organization representing more than 90 percent of the Ruthenian cultural and advocacy groups in this mountainous enclave. The reports are a familiar tactic used by the Kremlin-controlled media and social media trolls. Kiev and the West have accused Moscow of using information warfare to fuel the separatist movement, first in Crimea and then in eastern Ukraine. “The strategy is to show that there is a lot of unhappiness in Ukraine and to show the Ukrainian authorities are incapable,” said Margo Gontar, the editor and a co-founder of StopFake.com, a fact-checking project developed last year that aims to counter Russian propaganda. In Transcarpathia, most people seem to have dismissed the provocative reports. “Less than 1 percent of the population paid any attention to such stories,” said Volodymyr Chubirko, a Ruthenian and the head of the Transcarpathia regional council. The conflict in the east has claimed more than 6,200 lives and destroyed much of the industrial region’s infrastructure and economy. A fragile cease-fire is barely holding. Like the rest of the country, Transcarpathia has felt the effects of the war, raging some 900 miles away. Thousands of young men have been mobilized to serve in Kiev’s forces against the separatists. The draft has not always been popular among the region’s minorities. “We see this as a senseless war being fought between two Slavic brethren,” said Elemer Koszeghy, the editor of Karpati Igaz Szo, the oldest Hungarian-language newspaper in Transcarpathia. The local economy — based largely on tourism, timber and cross-border contraband — has taken a beating as the war batters an already faltering general budget. Inflation and a 70 percent devaluation of the currency mean fewer tourists are arriving to enjoy Transcarpathia’s mountain spas and ski resorts. The border with Slovakia is less than 5 miles away, and many locals simply slip across and find under-the-table work in construction or housekeeping. Last year his monthly salary was worth about $350. At today’s exchange rates, it’s just $110. Like the Ruthenians, the local Hungarians say they have been the target of Russian provocations. There are an estimated 150,000 ethnic Hungarians in Transcarpathia. Per Ukrainian law, there are Hungarian schools, and city councils can opt to use Hungarian as the administrative language. But many Hungarians would like to see greater representation in the central government. There has been a strong lobby for the creation of a consolidated voting district that would guarantee one of their own makes it to parliament. Last year Hungarian Prime Minister Viktor Orban, one of Putin’s close allies in Eastern Europe, called for autonomy for Ukraine’s Hungarian population. The call was met by an angry response from Kiev, and Koszeghy said the statement didn’t reflect the sentiment of the majority of Transcarpathia’s Hungarians. “There are many people who aren’t satisfied with the current Kiev authorities, but I don’t think there’s much fertile ground here for separatism,” he said. The Ruthenian population, however, is in a more difficult position, he said. Academics have debated for decades about the ethnic status of Ruthenians, also known as Rusyns or Ruthens. Their Slavic roots are so closely connected to Ukrainians’ that Kiev recognizes them as a subgroup in the Ukrainian ethnicity and their Slavic language as a dialect. Officially, there are 10,000 Ruthenians in Transcarpathia; Ruthenians say the number is more like 800,000. The Soviet Union forbade the recognition of the Ruthenians or their language out of fear that nationalist fervor would inspire the population to rise up against the communist regime. As a result, many of the region’s Ruthenians simply adopted the Ukrainian label. After Ukraine became independent in 1991, Ruthenians began looking for recognition as a separate ethnic group. Government recognition would grant support for Ruthenian schools, language development and other advantages granted to recognized minorities such as Romanians and Hungarians. “We lost our national identity after we became part of the Soviet Union. They closed our schools and took away our status,” Zhupan said. What the Ruthenians say they aren’t interested in is autonomy or a people’s republic. “Our issues with Kiev will be resolved only in a legal way,” Zhupan said.